The purpose of this study was to explore the motivations of sport management students during an experiential excursion to Super Bowl LI. The study pulls from prior questionnaires on volunteer motivations. A quantitative approach was employed using a 47-item questionnaire completed by students who volunteered at the National Football League Experience and at Super Bowl LI. The findings revealed that students were motivated by professional development, altruistic motivations, and lastly by the general experience of the Super Bowl. Moreover, these results suggest that class rank, or more specifically student maturity, impacts the underlying motivations for volunteering at a mega-event such as the Super Bowl. Prior research has shown that people volunteer for many reasons (19). Within the volunteering sector, student and non-student motivations may differ. 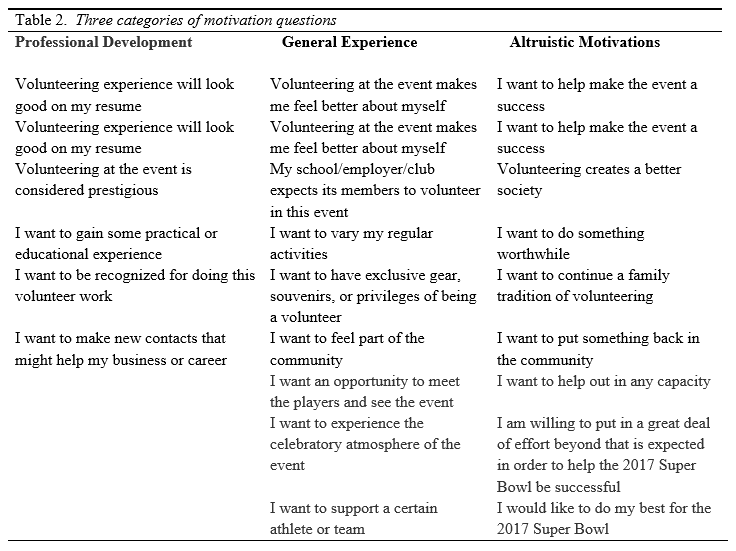 This study was conducted in order to determine student motivations and expectations of volunteering at the Super Bowl festivities to better help hiring managers identify the factors that are needed to motivate, appease, and retain student volunteers. Volunteers are relied on heavily in the sporting industry. The two most common types of sport volunteers are community sport event volunteers and student sport event volunteers. Community sport volunteers are usually local volunteers that assist on behalf of a non-profit club or organization. For this study, student sport event volunteers are intercollegiate students that tend to be sport management majors that assist in event operations on behalf of a non-profit club or organization. Past studies have shown the necessity and importance of volunteers in order to produce successful sporting events (2, 4, 5, 15, 17, 20, 22, 39, 40, 41). Sport managers’ and host committees’ purpose for recruiting volunteers is to create high quality events and lower costs in order to offset the costs of hosting sporting events. The Super Bowl regularly recruits and trains approximately 10,000 volunteers within a relatively short time frame. Host committees should identify volunteers’ motivations to improve management strategies for recruitment, retaining, and training (10). Cnaan and Goldberg-Glen (12) noted that understanding motivations for volunteering would help hiring managers appeal more persuasively to possible volunteers. The Commission on Sport Management Accreditation (COSMA) recognized experiential learning as a vital building block in prepping students for careers in the sporting world (11). Many studies have shown that educational programs should include experiential learning in their respective curricula (8, 9, 21, 23, 24, 31, 32, 33, 36, 37). Many studies have researched student motivations (1, 6, 7, 10, 16, 34, 35) but little research has has found both experiential learning and student motivation. Pate and Shonk (29) studied these concepts collectively but from a qualitative perspective. This study aims to quantitatively describe student motivations during an experiential excursion to Super Bowl LI. Williams and Parker (42) examined the effectiveness of leadership development activities applied in an experiential event management course. Students showed positive perceptions of the experiential learning experience and increased engagement levels (42). However, unless students become more acclimated with sporting world job duties and expectations by receiving more exposure especially prior to the culminating internship, “many students come away more confused about their career path than before their internship” (28, p. 46). Koo, Diacin, Khojasteh, and Dixon (25) surveyed undergraduate students in order to determine satisfaction levels during student internship experiences. According to Koo et al. (25), students that responded with higher satisfaction ratings with the internship experience were more likely to enter the sport management field than those who reported dissatisfaction within the internship experience. Pierce et al., (34) posits that student volunteer satisfaction was increased by factors of career, social, and love of sport, which ultimately, was the highest-rated motivation for volunteering. Students with a well-rounded quality education have a higher chance of placement within the sport industry and may be in greater demand within the marketplace (13, 14). Students involved in experiential learning may need to reflect on their work, which offers a chance to better appreciate and recognize the practitioner’s job duties and functions (18, 30). Moreover, students want to form an extensive network and build a solid resume prior to entering the job market (38). Elstad (19) noted, “in spite of the large numbers and the importance of volunteers during mega-events there has been limited research on this topic” (p. 76) and “there is a need to clarify the differences between causes, effects, and determinants of volunteers’ satisfaction in performance” (p. 82). Based on the literature review and the researcher’s personal volunteering experience, practical knowledge, and observations of a framework was conducted for this study. Three elements contributing to the motivation of student worker at mega-events include altruistic motivations, career motivations, and social/leisure/peer pressure motivations (general experience motivations). RQ1: To what length do the factors of altruistic motivations, professional development, or general experience motivate student volunteers at the Super Bowl? H1: The volunteer student altruistic motivations will be greater than the general experience motivations of students. H2: The volunteer student altruistic motivations will be greater than the professional development motivations of students. H3: The volunteer student professional development motivations will be greater than the general experience motivations of students. RQ2: To what extent does class level impact the altruistic motivations, professional development, or general experience motivations of students? H4: Upper-class students (Juniors and Seniors) professional development motivations will be greater than the professional development motivations of underclass students (Freshman and Sophomores). H5: Upper-class students (Juniors and Seniors) altruistic motivations will be greater than the altruistic motivations of underclass students (Freshman and Sophomores). H6: Upper-class students (Juniors and Seniors) general experience motivations will be greater than the general experience motivations of underclass students (Freshman and Sophomores). The sample in the current study consisted of student volunteers at Super Bowl LI in Houston, Texas. The students involved in this study volunteered at the National Football League (NFL) Experience located at the George R. Brown Convention Center, which provided fans NFL-themed games and activities. Students worked at interactive games such as a punt/pass/kick event, youth clinics, Lombardi trophy photograph station, hail-mary event, field goal kick event, and an autograph station. Students involved in this study volunteered on Super Bowl game day at the New England Patriots’ tailgate pregame party, at the Patriots’ post-party, and at the Champions’ Club party as greeters and wayfinders. The work detail varied for each student. Some students worked as line security, other students worked the interactive games, while other students checked in fans to participate in the interactive games. On game day, students greeted fans at parties and provided information and directions to patrons. A convenience sample of 81 students was conducted for the target population of student volunteers who participated in festivities during the week of Super Bowl LI. Questionnaires were administered and distributed to students prior to the day’s shift at the NFL Experience. Volunteers completed the questionnaire prior to reporting to their shifts at the NFL Experience. Respondents were asked to complete the survey on a volunteer basis and information would remain confidential. No incentives were used and participants were not required to divulge their name or any other identifiable personal data. The questionnaire was deliberately not distributed on the volunteers’ first day of work, to avoid sampling students who had not yet completed at least one volunteer shift. The survey took approximately 15 minutes to complete. Because the researcher personally administered and collected questionnaires in the NFL Experience volunteer meeting area all surveys that were distributed were collected. By collecting data in this way this helped avoid low return rates for the researcher. Of the 81 students who completed the survey 60.0% were males and 40.0% were females. Of the participants, 16.0% were freshmen, 19.8% were sophomores, 29.6% were juniors, 32.1% seniors and 2.5% were graduate students. The instrument used to measure student volunteer motivation and commitment in this study was a 47-item questionnaire. Modifying surveys from prior studies highlighting volunteer motivation, behavioral intentions, expectations, experiences, and satisfactions helped to create the survey (10, 20, 26, 29, 39). The questionnaire contained two sections. In section I, the participants were asked to identify demographic characteristics: gender, age, educational year, employment status, yearly volunteer hours, and years of experience at other, similar events. In section II, the participants were asked to indicate their level of agreement with how essential the 47 topics are to both student volunteer motivation and student volunteer commitment. A 5-point Likert scale was used, and values were assigned to the responses as: 5-strongly agree, 4-agree, 3-neither disagree nor agree, 2-disagree, 1-strongly disagree. The data was collected between February 1, 2017 and February 4, 2017. After data collection, the questions were divided into three categories: altruistic motivations, professional development motivations, and general experience motivations. These groupings were used to test the hypothesis. Altruistic motivations included questions such as “I want the event to succeed” and “I want to do something worthwhile.” Professional development motivations included items relating to resume enhancement and networking. Finally, general experience motivations included items such as “I want to meet the players” and “I want the exclusive gear.” Not all items in the questionnaire were used in the analysis. The data from the surveys were analyzed using Microsoft Excel. The internal consistency reliability (Cronbach’s alpha) of the questionnaire was 0.947, well above the 0.70 commonly accepted threshold for reliability (27). The data were summarized and analyzed using independent sample t-tests, a commonly accepted approach to analyzing Likert scale data with large sample sizes. Post-hoc analysis was also used to analyze differences amongst the classes. RQ1 examined the differences with respect to motivational categories regardless of class rank. Table 1 summarizes the averages and standard deviations for each of the categories of motivation examined. Table 2 lists the questionnaire items that were used in the study. Gender was not a factor for any of the motivation categories: altruistic motivations (p = 0.365), professional development motivations (p = 0.457), and general experience motivations (p = 0.211). Hypothesis 1 predicted that altruistic motivations for the volunteer student would be greater than general experience motivations. H1 was supported (p < 0.001) to indicate that students are volunteering for the event for altruistic motivations to a much greater extent than simply to have the experience at the Super Bowl. Hypothesis 2 predicted that student altruistic motivations would be greater than professional development motivations. H2 was not supported (p = 0.14). Hypothesis 3 predicted that professional development motivations are greater than general experience motivations for the student volunteers. H3 was also supported (p < 0.01) showing that student volunteers’ professional development motivations are greater than the general experience motivations. RQ2 centered on potential differences between the classes. Table 3 summarizes the averages and standard deviations for each class and category of motivation. The samples sizes for each class are as follows: Freshman = 13, Sophomore = 16, Junior = 24, Senior = 26. Hypothesis 4 predicted that upper-class students (Juniors and Seniors) professional development motivations will be greater than the professional development motivations of underclass students (Freshman and Sophomores). This hypothesis was supported (p < 0.001) to show that students closer to graduation and thus entering the workforce are more motivated to focus on professional development activities such as networking and resume building activities. Hypothesis 5 predicted that upper-class students (Juniors and Seniors) altruistic motivations will be greater than the altruistic motivations of underclass students (Freshman and Sophomores). This hypothesis was supported (p < 0.001). Upper class students are more motivated by altruistic intentions than Freshman and Sophomore students. Finally, Hypothesis 6 states that upper-class students (Juniors and Seniors) general experience motivations will be greater than the general experience motivations of underclass students (Freshman and Sophomores). This too was supported (p < 0.001). Upper-class students are more motivated to a higher extent for the general experience than the underclass students. Post hoc Tukey analysis showed significant variations within each of the classes by motivational category. For altruistic motivations, the mean score for Sophomores (M = 4.04, SD = 1.16) was different from Juniors (M = 4.58, SD = 0.86) and Seniors (M = 4.33, SD = 0.89). Additionally, the altruistic motivations for Freshman (M = 4.14, SD = 1.16) differed from Juniors. There were no significant differences between Freshman and Sophomore, Freshman and Senior, or Junior and Senior. Similarly, differences in means for professional development motivations were found between Sophomores and Juniors, Sophomores and Seniors, and Freshman and Juniors. Freshman and Sophomores both differed from Juniors for the general experience motivational category. There were no differences in means between Freshman and Sophomores or Seniors, between Sophomores and Seniors, or between Juniors and Seniors. Taken together, these results suggest that class rank, or more specifically student maturity, impacts the underlying motivations for volunteering at a mega-event such as the Super Bowl. Bennett, Drane, and Henson (3) found that students engaged in experiential service learning developed an appreciation for helping others and an enhanced need for social responsibility. The study recruited only student volunteers from Super Bowl LI and not all student volunteers working Super Bowl LI could be recruited because of time constraints, job placement locale, and ease of access. Some of the findings may be restricted to the participants; in other words, volunteers in different sport events may have different motivational and commitment factors. This study offers the opportunity to continue to investigate this model of volunteer motivation in other field excursions in the sport management field. Altruism encompasses many variables, such as donating money to charity, and not all aspects of altruism were measured in this study. More exploratory studies need to be conducted at mega-events such as the World Cup, Olympic and Paralympic Games (29) as well as the College Football Playoff, the National Collegiate Athletic Association Final Four, the College World Series, and All-Star games. Future studies could extend beyond the United States borders and collect data to determine generalizability by examining differences throughout sport event volunteering in other countries and continents. Future studies could determine if maturity impacts the effort and outcome students put forth while volunteering at mega-events. Future studies could explore and survey group leaders of such field excursions (29) specifically targeting college sport management programs at mega-events, in terms of planning travel arrangements, including: lodging, transportation, food, and volunteer work schedules. The findings revealed that students were motivated by professional development, altruistic motivations and lastly by the general experience of the Super Bowl. Moreover, these results suggest that class rank, or more specifically student maturity, impacts the underlying motivations for volunteering at a mega-event such as the Super Bowl. When volunteer management staff provide an accurate job preview, students gain knowledge and competencies that will aid in arming them with tools to help with future job placement. Faculty should leverage relationships with practitioners in order to help students improve satisfaction by garnering quality volunteer experiences. Students need to communicate motivating factors with faculty members in order to find the best fit for both the student and the mega-event volunteer organization. 1. Astin, A. (1999). Student involvement: A developmental theory for higher education. Journal of College Student Development, 40(5), 518–529. 2. Auld, C. & Cuskelly, G. (2001). Behavioral characteristics of volunteers: Implications for community sport and recreation organizations. Parks and Leisure, 4(2), 29-37. 3. Bennett, G., Drane, D., & Henson, R. (2003). Student experiences with service-learning in sport management. Journal of Experiential Education, 26(2), 61–69. 5. Blanc, X. (1999). Managerial programs in combining sports projects with volunteerism. Paper presented at the Volunteers Global Society, and the Olympic Movement Conference, Lausanne, November 24-26. 6. Brophy, J. (1987). Synthesis of research on strategies for motivating students to learn. Educational Leadership, 45(2), 40–48. 7. Burns, A.C., & Gentry, J.W. (1998). Motivating students to engage in experiential learning: A tension-to learn theory. Simulation & Gaming, 29(2), 133–151. 8. Canberg, A. S. (2009). Event management: An experiential learning approach. Schole: A Journal of Leisure Studies & Recreation Education, 24, 131–136. 9. Charlton, R. (2007). Experiential classroom learning for sport management students: Preparing them for the real world. Virginia Journal, 29(2), 43–45. 12. Cnaan, R. & Goldberg-Glen R. (1991). Measuring motivation to volunteer in human services. Journal of Applied Behavioral Science, 27, 269-284. 13. Cuneen, J. (2004). Managing program excellence during our transition from potential to merit. Journal of Sport Management, 18, 1-12. 14. Cuneen, J., & Sidwell, M. (1994). Sport Management field experiences. Morgantown, WV: Fitness Information Technology. 15. Daly, J. (1991). Volunteers in south Australian sport: A study. Canberra; Australian Sport Commission. 16. Deci, E.L., & Ryan, R.M. (1985). Intrinsic motivation and self-determination in human behavior. New York: Plenum. 17. Dunn, T. (1989). Volunteers and predictable motivations. Ph.D. dissertation, Colorado State University, United States – Colorado. 18. Edwards, A. (1999). Reflective practice in sport management. Sport Management Review, 2, 67–81. 19. Elstad, B. (1996). Volunteer perception of learning and satisfaction in a mega-event: The case of the XVII Olympic Games in Lillehammer. Festival Management & Event Tourism, 4, 75-83. 20. Farrell, J.M., Johnston, M.E., & Twynam, G.D. (1998). Volunteer motivation, satisfaction, and management at an elite sporting competition. Journal of Sport Management, 12, 288–300. 21. Foster, S., & Dollar (2010). Experiential learning in sport management: Internships and beyond. Morgantown, WV: Fitness Information Technology. 23. Jones, D., Brooks, D., & Mak, J. (2008) Examining sport management programs in the United States. Sport Management Review, 11, 77-91. 24. Jowdy, E., McDonald, M., & Spence, K. (2004). An integral approach to sport management intenships. European Sport Management Quarterly, 4(4), 215-233. 25. Koo, G., Diacin, M., Khojasteh, J., & Dixon A., N. (2016). Effects of internship satisfaction on the pursuit of employment in sport management. Sport Management Education Journal, (10)1, 29-42. 27. Nunnally, J. (1978). Psychometric theory (2nd ed.). New York: McGraw-Hill. 28. Odio, M., Sagas, M., & Kerwin, S. (2014). The influence on internships on students’ career decision making. Sport Management Education Journal, 8(1), 46-57. 29. Pate, J. & Shonk, D. (2015). An experiential learning trip: Exploring student experiences and motivations for volunteering at the Super Bowl. 30. Pauline, G. (2013). Engaging students beyond the just the experience: Integrating reflection learning into sport management. Sport Management Education Journal, 7(1), 1–12. 31. Pauline, G., & Pauline, J. (2008). Teaching sport sponsorship activation through a client-based experiential learning project. Sport Management Education Journal, 2(1), 19–37. 32. Petersen, J., & Pierce, D. (2009). Professional sport league assessment of sport management curriculum. Sport Management Education Journal, 3(1), 110–124. 33. Pierce, D., & Petersen, J. (2010). Experiential learning in sport sales: Student perceptions of sport sales expectations, skills, and preparation. Sport Management Education Journal, 4(1), 49–59. 34. Pierce, D., Johnson, J., Felver, N., Wanless, E., & Judge, L. (2014). Influence of volunteer motivations on satisfaction of undergraduate sport management students. Global Sport Business Journal, 2, (2), 63-72. 35. Ryan, R.M., & Deci, E.L. (2000). Self-determination theory and facilitation of intrinsic motivation, social development, and well-being. The American Psychologist, 55(1), 68–78. 36. Southall, R., Nagel, M., LeGrande, D., & Han, P. (2003). Sport management practica: A metadiscrete experiential learning model. Sport Marketing Quarterly, 12(1), 27-36. 37. Spence, K., Hess, D., McDonald, M., & Sheehan, B. (2009). Designing experiential learning curricula to develop future sport leaders. Sport Management Education Journal, 3(1), 1–25. 38. Stratta, T. (2004). The needs and concern of students during the sport management internship experience. Journal of Physical Education, Recreation and Dance, 75(2), 25-34. 39. Strigas, A., & Jackson, E. (2003a). Motivating volunteers to serve and succeed: Design and results of a pilot study that explores demographics and motivational factors in sport volunteerism. International Sport Journal, 7, 111-124. 40. Strigas, A., & Jackson, E. (2003b). The importance of motivational factors and demographic attitudes at the design, marketing, and implementation of successful volunteer recruitment programs: What sport and recreational professional should investigate a first. Research Quarterly for Exercise and Sport, 74, A-24. 41. Williams, P., Dossa, K., & Tompkins, L. (1995). Volunteerism and special event management: A case study of Whistler’s Men World Cup of Skiing. Festival Management & Event Tourism, 3, 83-95.